There are a couple things that are summer staples around our house. Watermelon and popsicles. In fact, it is 9:30 at night right now and my 2 year old is asking for watermelon. I know she really needs to be in bed………but it’s summer and she is being cute and happy……….and lets face it – when you are 9 months pregnant there are very few things that urgently get you to get up and walk up a flight of stairs. I’m secretly hoping she will just somehow put herself to bed. Back to watermelon. It is such a delicious and refreshing treat – how easy would it be to stick a popsicle stick in it, put it in the freezer……….and voila – all natural fruit pop. Well, it was just as easy as it sounds. 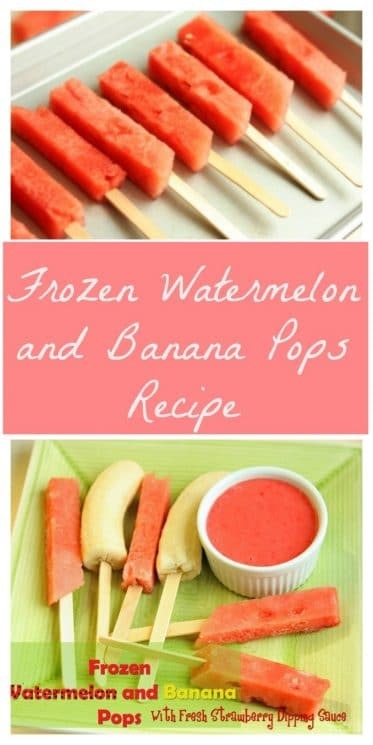 Here’s our Frozen Watermelon and Banana Pops Recipe. 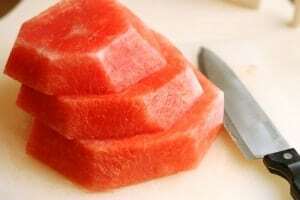 Start by slicing your watermelon into ‘discs’. 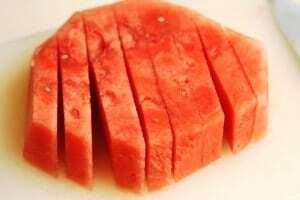 To use our watermelon cutting method, see this post. Cut the discs into ‘strips’ and then cut those in half if you want a smaller ‘pop’. Basically you just want pieces that would make good popsicle shapes. Place popsicle sticks in the center of each piece. Place on a tray and freeze. You will do this with bananas also if you are making them at the same time. Blend together and pour into a serving dish. 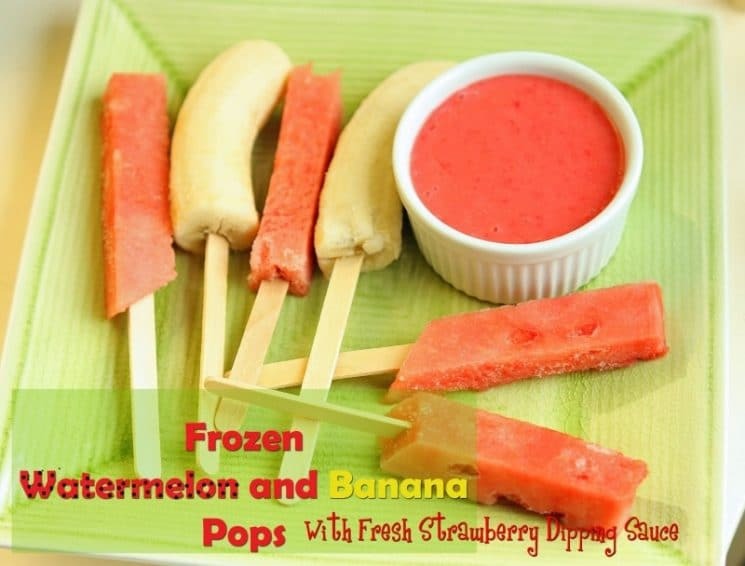 After a couple of hours you will have yummy fresh fruit pops with just one ingredient – fruit! You can whip up a huge batch of these in about 10 minutes. And not only are they fast, but they are cheap! 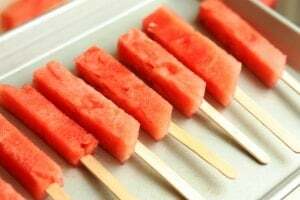 You can make one of these pops for about 10 cents depending on how much you get your watermelon for. And you can feel good about letting your kids eat more than one! 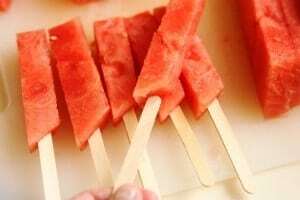 I used frozen sticks (or fingers) of watermelon and rockmelon as teething soothers for my babies – for when they are old enough to grab a little stick in their hands and need something cold against their sore gums – (and it just melts away inside their mouths). These look delicious. Great comment from Susie as well, i hadn’t thought of that for my daughter Lily.